Do you want a real unique and somewhat high-tech tattoo on your body? Then the Black Light Tattoos are for you. The black light or UV tattoos have gained tremendous popularity lately. The exotic glowing tattoos look amazing and are not at all typical. Made of special ink, which is visible under the UV light, the black light tattoos may go nearly invisible under non-UV environment depending upon the ink used. Thus, the unique illuminated tattoo art is for those, who wish to flaunt their crazy body art in the dark or in black light environment. 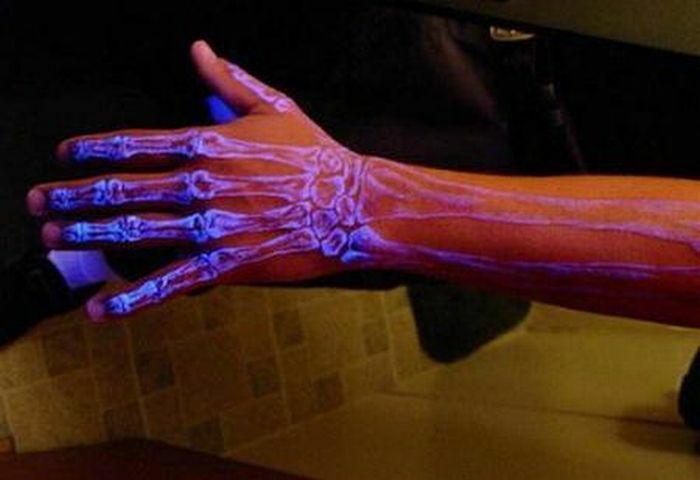 UV light tattoos with their extraordinary appeal look stunning and very unusual. If you liked our selection, perhaps these other posts will interest you too, Glow In The Dark Tattoos, Music Note Tattoos, Only God Can Judge Me Tattoos, and Boondock Saints Tattoos. Illuminating angelic damsel with her glittering tresses and mystical aura. Radiant swallow bird flying and carrying the message of love to all who are in need of love. The devil magic skull with a frighening radiance on it. Black light effect on a traditonal art tattoo signifying the ultimate enlightenment attainable from one’s roots. Crazy pirate pin-up girl sailing in the dark to reach the hidden treasure. Haunting friday the 13th night facing scary encounters every other minute. Beautiful butterflies flying with their glowing wings, apearing like twinkling stars in the night. Unique Celtic UV black light tattoo to stand-out in the crowd. Turn your body into a black starry night and feel like heaven. Do not just be a star, but a glowing super star, which illuminates like no other. Turn of the lights to see the sparkling creativity in the dark. Not just an apple, but the Apple with the danger sign, bewaring not to dare entering into a competion. See through the skin to feel the real strength of my deadly claw. My babydoll art is adorably sizzling, dare not call it ordinary. Yoda with its magic light sword going to rule the Star Wars Universe.